Continue to Yampupata. Hike down to the bay and take a boat to the Island of the Sun (30 min), the sacred spot of the Incas, land near Pillkoqaina ruins. Don’t miss a great sunrise! Take a boat to the northern part of the island, visit the Chinkana ruins and Sacred Rock (1 hour), and then hike crossing most of the Island back to Ecolodge (3 hours). Lunch. Afternoon free to enjoy the beauty and mysticism of the area. Hike through the village of Yumani in the garden of the Incas, to take the boat to Copacabana (1 hour). Transportation to “La Rinconada” at the foothills of the Andes Range. After box lunch, hike about 2 hours to Chiarkota lagoon and back. Return to La Paz. Short sailing in a smaller boat in search of a good place to practice sport fishing: with chances to fish the ravenous red piranha and observe pink dolphins. At noon, we return to our main boat where we will start sailing north to find a good place to do sun and beach. Lunch at 1:00 p.m. enjoying the breeze of the river while sailing on the Mamoré River. After lunch, enjoy some free time to digest the meal. Transfer to a beautiful beach where you can bathe and / or sunbathe on the famous deserted beaches of Beni. 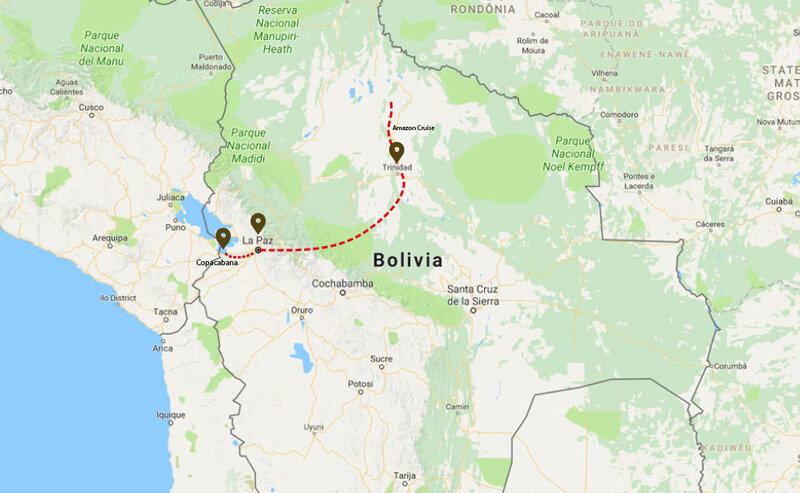 …the eastern Bolivian, while riding in the middle of the open pampas of Beni. At the end of this activity, visit an indigenous community. Over here, learn the history of the ethnicity. …finding and visualizing some species of fauna that can be found in the jungle. After lunch, you will start your return trip to Puerto Los Puentes where you will be waiting for the taxi to take you to the Airport of Trinidad to take your flight to La Paz.